Uniregistry is taking the domain investment game very seriously, and a good portion of its platform-generated revenue is via “pay per click” or PPC. There are many ways to stop potential click fraudsters, a worldwide phenomenon that costs advertising providers billions of dollars in lost revenue. The Uniregistry methodology is without any doubt, ingenious. By implementing the latest AI algorithms, the Uniregistry “domain captcha” is virtually unbreakable. 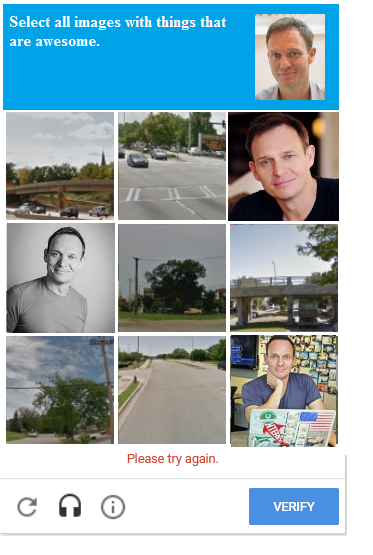 We were shown a beta version of what it will look like, and sharing it below – with many thanks to Dale G.
Without a doubt, it’s the strongest domain captcha ever devised. I selected all bridges, but it’s not letting me in?